This post is part of a 2 series blog post about the Basics of Pay Per Click Marketing. In this post I will discuss the basics of PPC and how to prepare for your first campaign. PPC 101 Part 2 will be about practical aspects and touch some slightly more advanced topics. When I first started out in PPC (Pay Per Click Marketing) I knew little about this industry. I had this rough idea that PPC ads were these little yellow text ads on top of Google’s search results. When I searched for something like “buy MacBook Pro in London” I was immediately shown a few ads which were offering exactly what I was looking for. Another thing I knew is that every time I clicked on an ad Google would make money from it. Actually, a whopping 96% of Google’s revenue came from advertising in 2011. As I learned more about PPC I saw that there is much more to it than most people think. Paid Search is a very complex area of marketing, which is also quite competitive. Most retail brands already use PPC in one way or the other – either by themselves or through affiliates. If you have your own website, online shop, plan on starting one, or if you just want to learn the basics of PPC, than the following will be especially interesting for you. Before starting to set-up your first campaign you have to know a few basics, which will help you to understand how the whole process of creating and managing a PPC account really works. One thing you need to know first: Google is not the only search engine, which provides PPC advertising services. In fact, every single search engine does it! Besides Google AdWords, there is Bing (Microsoft) adCenter, Yandex Direct (Russia) and Baidu Paid Search (China) amongst many others. As we all know, Google’s network is huge! Sites like YouTube, Blogger, Google Maps & Google News all belong to Google. This means that your ads can also be served on these sites. Have you ever seen an ad before a YouTube video or a little text ad on the bottom of it? Or have you seen text ads next to some articles yoy read online? Yep, that’s paid search. You see, it’s also not always text ads. Google AdWords allows advertisers to use (animated) banner ads, text ads and video ads. Also, Google has an option, which is called “Managed Placements“. This means that if a website joins Google’s advertising network (i.e. The Guardian), advertisers can place their banner ad directly on the website. This 101 will be mostly about text ads, as this is the most common way of doing PPC. Why would somebody use PPC advertising? PPC gives you the opportunity to drive traffic to your website extremely fast. Once you create your campaign(s) your ads will start showing within 1-2 days. It gives your brand visibility, increases traffic and, if you have an online business, it can give you a nice revenue bump if you do it right. One of the retail-client accounts I was working on generated nearly 40% of their online revenue through paid search advertising. And that’s quite normal. Besides everything mentioned above, there is one more benefit, which is, in my opinion, the most important one. PPC advertising gives you total control over your advertising campaigns and lets you track every single cent you have spent and received. This way you can easily calculate the ROI of your advertising and optimize your campaigns for maximum performance. Also, Google is now increasing the amount of advertising on SERPs and decreases the amount of “organic” search results. Google already tested result pages with only 7 natural results, compared to the regular 10. So you are interested in starting a campaign of your own? It’s fairly simple to do if you know how to use a computer and follow the instructions below. Create an AdWords account. Follow these instructions on how to create an AdWords account. Choose the keywords, which you want to trigger your ads. For example: if you sell TVs, you probably want to appear for the search term “buy TV”. This is just one of the thousands (or even millions) of possible keywords. When doing keyword research, check your keywords in the Google Keyword Tool, which will show you the search volume (popularity) of your keywords and other “keyword ideas”. I will describe the process of keyword research later in this post. Determine your audience: know the people you are selling to. This doesn’t mean that you have to shake hands with every single one of them. Know what your target audience is about. Know what they like, what they do, how they behave. Check out the article about How to Define Your Target Audience. Ad Rank – Who Gets The Top Position? Back in the days when PPC was just starting out there was only one way to determine which ad will show higher on the page and which won’t show at all: plain auction. The one advertiser who bids higher gets the better position in the SERPs. That was in the past. But now the situation has changed. Google has a system which helps the search engine to control advertising quality by making it a ranking factor. The formula looks like this: Ad Rank = max. CPC (the maximum amount you are willing to pay for a click on your ad) multiplied by the so-called “Quality Score”. The higher your Quality Score, the lower will be your CPC. The advertiser with the higher ad rank will get the better position. Now you should know that Quality Score (from now on “QS”) is a very important factor in your advertising on Google. QS is some kind of mystery for advertisers. There are a bunch of criteria, which are known for having influence on your QS, but nobody knows the exact factors. Basically, the higher your overall relevance, the higher your Quality Score. For sure, there are way more influencing factors, but these 3 are the most basic ones everybody should know about. Before creating a new advertising campaign you should first know how you will structure everything. 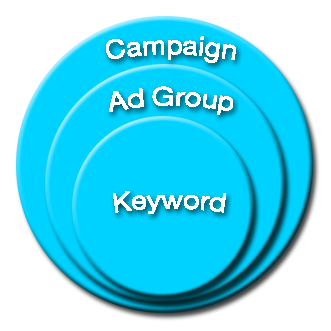 There are a few “layers”, which will make up your account: The actual Account > Campaigns > Ad Groups > Keywords. Meaning that your Keywords are bound to a group of ads. This group of ads is part of a campaign. The campaign will be part of your account. Simple as that. Now you should choose a list of keywords, which you want to trigger your adverts. To do that, go to the Keyword Research Tool and enter the keywords you had in mind. This tool will not only help you to estimate how popular the keywords are but it will also give you a list of related keywords or “Keyword Ideas”. Let’s assume that you choose 10 keywords you want to appear for. For example, you have the keyword “buy TV in London”. But what happens when somebody searches for “buy TV in London online”? This is where so-called “Keyword Match Types” come in. Let’s take the keyword “buy TV in London” and try to use it with the three different matching options. This matching option would make your ad show for the query “new TV buy in London online”. This is why this match type is called “Broad”. This type needs the search query to have the exact same word order as your keyword, but can have additional words in front or behind it. Meaning that your ad would be triggered if somebody would search for “online buy TV in London cheap”. Exact Match is pretty much self-explanatory. Your ad is triggered ONLY if the search query matches your keyword EXACTLY. A few months ago, Google introduced an option to opt-in for “Near Match”. This option allows Google to trigger your ad if the search query “closely matches” your keyword, is a plural/singular or a common misspelling. So you won’t have to worry about that. But let’s say that you sell only Samsung TV’s and don’t want to waste your budget for people looking for Panasonic TV’s. Don’t worry, Google has taken care of that, too. AdWords allows you to add “negative keywords”. If your keyword is “buy TV in London” and you add the negative keyword “-Panasonic”, than the search query “buy Panasonic TV in London” won’t trigger your ad. You can add whole lists of negative keywords to your campaigns. To learn more about PPC, check out PPC 101 – Part 2. In PPC 101 Part 2 I will discuss slightly more advanced topics, including ad copy writing, ad extensions, tracking, targeting and reporting.